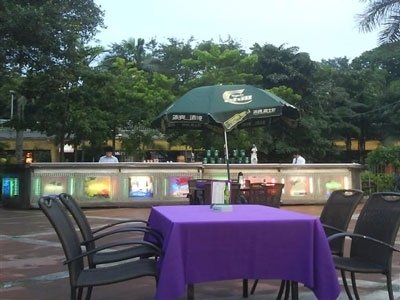 The Rose Garden Club in Shamian Park has one of Guangzhou's best riverside views, and the quiet shade of the park's Banyan trees along with it. Their mix of Chinese and international food includes steak, baked rice, seafood, spaghetti and curry. You can drop between 35 to 150 RMB on a dish here, and wine goes for between 150 and 800. Getting there: Take bus 110, 105, 103, 102, 538 or 81 and get off at Wenhua Gongyuan (Cultural Park) bus terminal. Walk under the Renmin bridge and you will reach the Shamian area. Walk along Shamian Nanjie (South Shamian Street) and you will find Shamian park Or take Metro Line 1, Huangsha Station, Exit D. Cross over walking bridge, continue straight on and turn left after Victory Hotel. You will arrive at Shamian Park with The Rose Garden at its right end.